I read the definition of the strange neurosis not from a dictionary or the most current DSM-IV but from the back of a beer can. All the brews at Alarmist Brewing Company held this similar theme. Celebrating the quirks of the human psyche each beer is named for embarrassing, awkward, or otherwise scary situations. In their new taproom in Chicago’s historic Sauganash neighborhood I sat at the high bar gazing up at a menu with its titles of cringe-worthy scenarios. 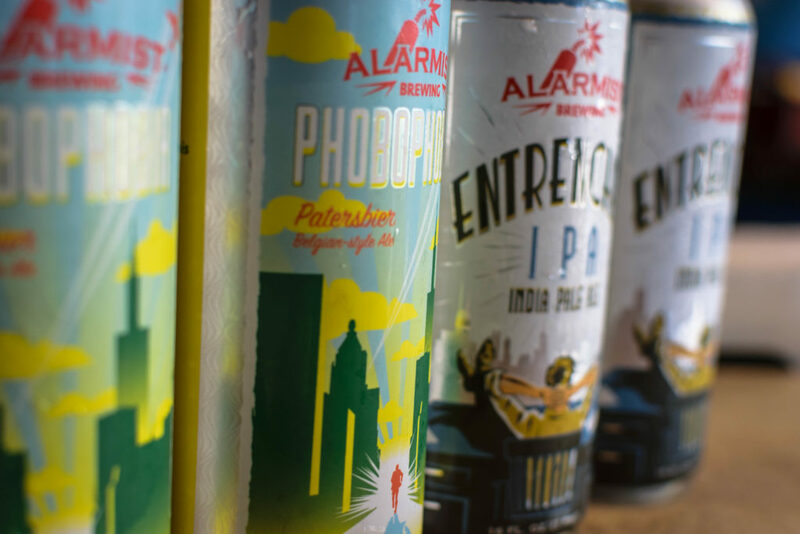 Alarmist is the product of Gary Gulley, an engineer turned brewer whose passion for great tasting beer, good sense of humor and knack for brewing inspired him to found the up-and-coming establishment. Its Gulley’s good humor and the help of his son that the beers acquired their unique names. 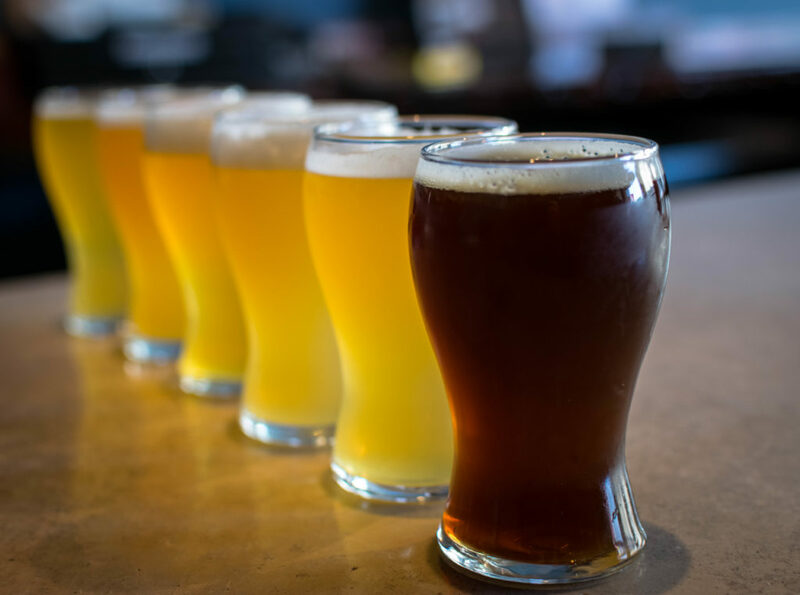 Tongue-and-cheek titles such as Dud Parachute, Pogonophobia (fear of beards), and Pantsless offer great tasting brews as well as a good chuckle. The establishment’s logo, a stick of dynamite with a lit fuse is the perfect sigil for the brewery’s theme. Across the ample wooden bar in Alarmist’s taproom I was greeted by Chris. Friendly and informative he spoke passionately about each of the brewery’s offerings. I could tell right away that they were all labors of love, slowly perfected overtime. “We really wanted to make a great run of flagship beers.” he explained as he pulled out several taster glasses. “So many other breweries just pump out a new experiment batch every week.” he added as he turned to the taps, pouring me a flight of his favorite selections. With a row of beer in front of me Chris watched eagerly as I eyed the glasses. Light from the far window shown through my taster of Phobophobia, making its golden color shine all the brighter. A traditional Belgian style table-beer the combination of German Pilsner malt and Czech Saaz hops mingled to create notes of biscuit and spice with a bold earthy aroma. Hints of fruit make for a sweet finish on this complex Belgian. Pantsless is Alarmist’s flagship beer, the first of Gary Gulley’s creations when the brewery opened its doors. An American style Pale Ale, Pantsless blends Mosaic and Motueka hops to create notes of lemony citrus and grapefruit with a touch of pine. Subtle bitterness makes this pale refreshing and sessionable. Pantsless certainly did talk loud. Entrenched is an IPA that is uniquely Illinois. Caramel and Munich malts equal out hints of citrus, lemon, and fruit. Not as hop forward as a West Coast style IPA the bitterness packs just enough punch to make a complex and balanced flavor profile. Alternative Facts, a not so subtle quip at the current political environment is a Belgian style blonde with full flavor. Belgian yeast, German malt, and American Chinook hops make a trifecta for refreshing drinkability with a crisp finish. Polishing off my glass of Alternative Facts the irony of Alarmist’s concept didn’t escape me. The whole idea behind the brewery’s theme was engrained in the early panicked and overwhelming feeling Gulley felt while starting the new venture. Knowing he put so much at stake and that failure was not an option. But with a mind set towards perfecting a business model and investing time and patience towards developing a core line up of solid great tasting beer Gulley’s fears were unfounded. If you’re in the market for some good Chicago craft beer head over to the city’s north side, there’s no cause for alarm. 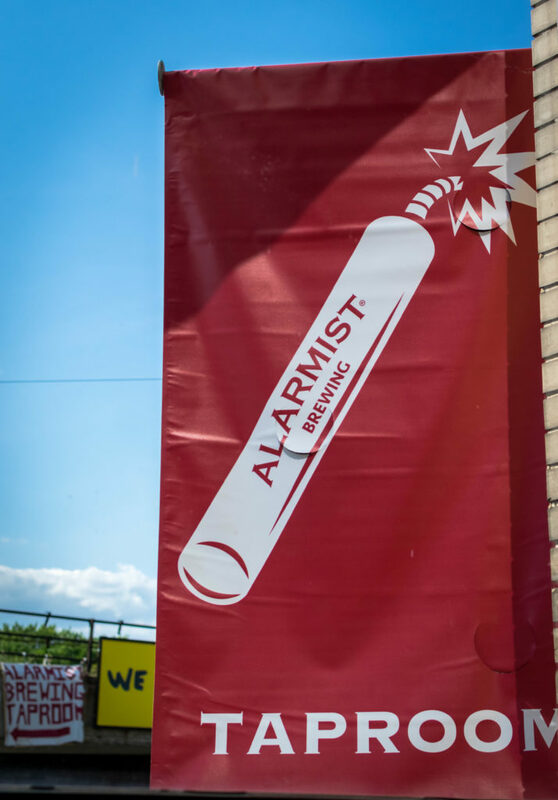 Nice blog on Alarmist, I do enjoy their pantsless beer. At last we talked about you coming to Chicago you were our tour guide in CO, great time even though it was rainy.